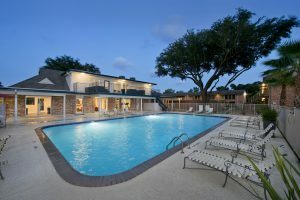 Compass Pointe is a 250-unit community located in Houston Texas. 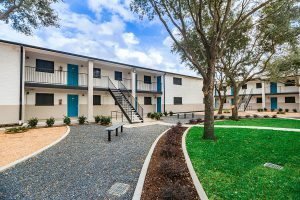 Built in 1971, the property features an excellent layout with 17 apartment style buildings and represents an opportunity to acquire a stable high occupancy project with a value add component. The property is located less than three miles north of north loop road 610 allowing for immediate convenient access to downtown Houston and the area’s growing employment and retail centers. The property provides a unique value-add opportunity. •	Houston continues to experience strong economic growth. •	Ability to generate an additional $40/unit per month through burn off of loss to lease and getting all rents to market. •	Property has a value add component as the vast majority of the unit interiors have not been updated. A post-purchase analysis on capital return vs leaving this opportunity for the next buyer will be performed. •	The current owner is not utilizing the sub-meters on the property. A RUBS for electric and water will be implemented upon lease rollover which will generate an additional $30 per month per unit. •	High occupancy history, currently 98% occupied. Compass Pointe consists of 250 units totaling 194,110 rentable square feet in 17 – two storey apartment style buildings. The community is conveniently positioned in the Independence Heights/Northline area of near north Houston (an area on the brink of redevelopment), less than 2 miles outside of Loop 610. The previous owner completed a $1.2M rehab in 2013/2014. 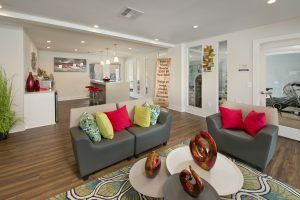 Some of the major expenditures were; Interior Improvements consisting of Leasing Center upgrade, replacement of many appliances and AC’s, interior paint and resurfaced counter tops, new faux‐wood vinyl flooring in some units, carpet, replacement of some interior lighting fixtures as well as other interior improvements. Exterior Improvements, consisting of full paint including metal, Perimeter Fencing, Access Gates repair, Solar Screens, Firewalls, Front Doors, Landscape Improvements, Tree Trimming, New Signage, and Parking and Walkway Repairs, New Playground Equipment and Soccer Field in the Park Area.